Authorize.Net is a payment gateway that allows you to accept online credit card payments on your website. Before you can integrate your Wild Apricot site with Authorize.Net, you must have an Authorize.Net account. If you enable a payment system other than Wild Apricot Payments, and your organization is based in the US or Canada, a 20% Payment System Servicing Fee will be applied to your account's billing plan on your next renewal date on or after July 2, 2019. For more information, click here. Once you've integrated your Authorize.Net account with your Wild Apricot site, visitors to your site can pay online for membership fees and event registrations, and make donations. When a visitor fills out an integrated online form on your Wild Apricot website (e.g. membership application or event registration) and chooses to pay online, they will be directed to a secure Wild Apricot payment form to make the payment. On the form, they fill out their credit card details and their billing information, then click the Pay button to complete the payment. For security reasons, credit card information is not stored in Wild Apricot. Instead, it is securely transmitted to Authorize.net where it is processed. Authorize.net then returns the status of the payment transaction, which is recorded in your Wild Apricot transaction details. Instructions for third-party payment systems are provided as a courtesy and may contain out of date information or screen clips. For the latest instructions, consult the payment provider's website. Before you can set up your Wild Apricot site to accept online payments through Authorize.Net, you must have an Authorize.Net account. 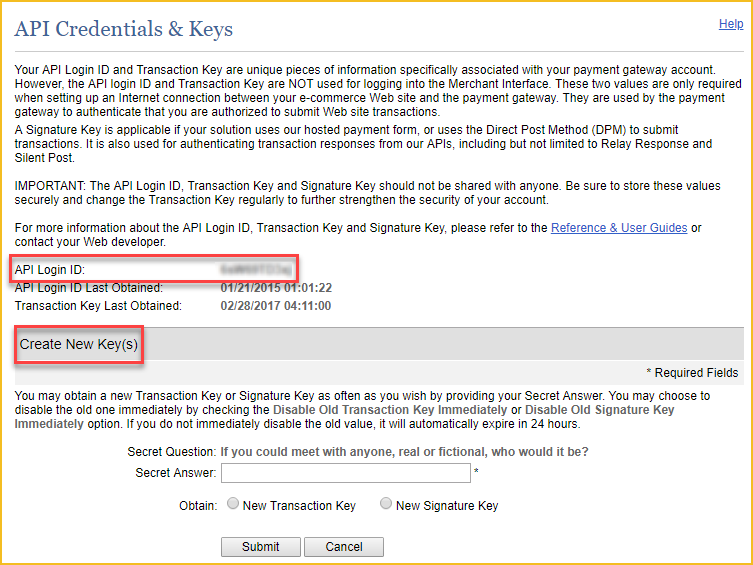 To integrate with Wild Apricot, you will need your API login ID, transaction key, and public client key from Authorize.Net. These are not the same as the login or password you use to log into Authorize.Net. Log into your Authorize.Net account. Under Security Settings, click API Credentials & Keys. The API login ID will be displayed on the screen that appears. From here, you can also generate a new transaction key. Return to the Settings screen and select the Manage Public Key option (under Security Settings). On the screen that appears, you can copy your public client key or create a new one. If you want to set up recurring payments for membership fees, you must enable the Customer Information Manager (CIM) service within your Authorize.Net account. Under the Settings menu, click Finances. 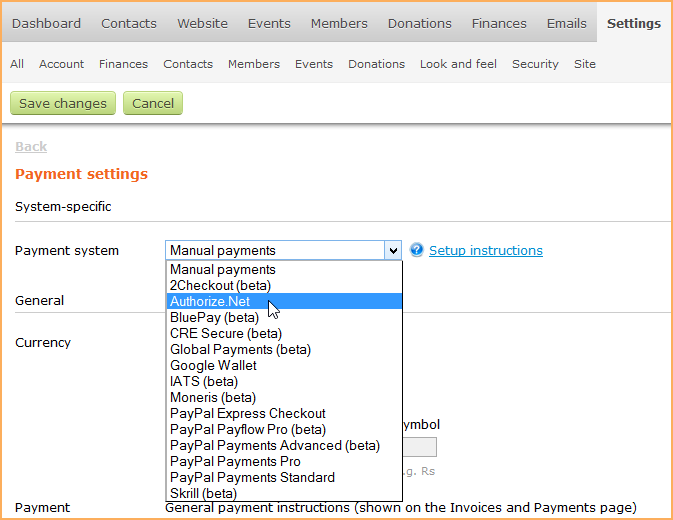 From the Finances settings screen, click Payment settings. On the Payment settings screen, click the Edit button. If you don't see an Edit button at the top of the screen, scroll down to the bottom of the screen and click Other payment settings, then click the Edit button on the screen that appears. 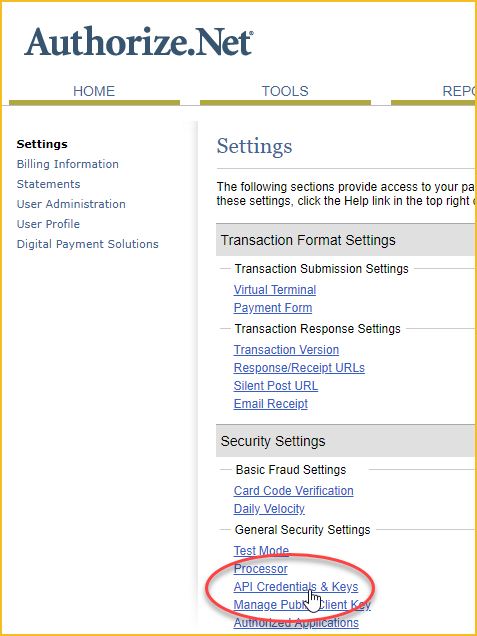 Click the Payment system drop-down list and select Authorize.Net. If you want to begin accepting online payments immediately, click the Live radio button. If you want to test your settings using test or sandbox accounts provided by your payment provider, click the Test/Sandbox radio button. While in test mode, your payment provider will accept or decline your test transactions as it would live transactions, but will not charge any credit cards or update any bank accounts. Wild Apricot will, however, create payment records and update Wild Apricot balances as it would with live transactions. For more information, see Live vs. test/sandbox modes. Enter your API login ID. Enter your Merchant transaction key. 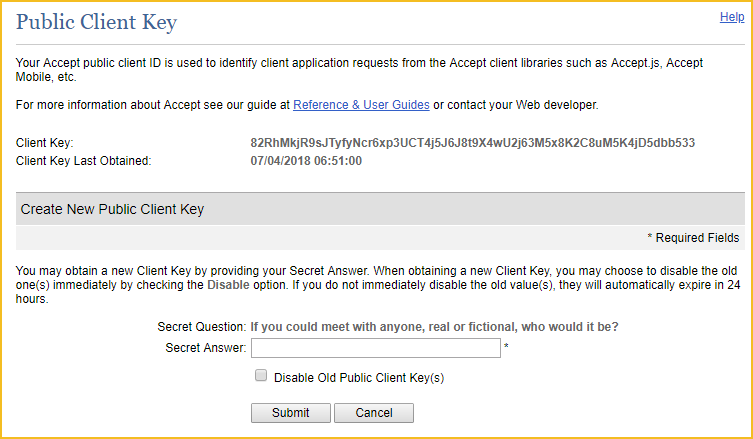 Enter your public Client key. Click Validate account to make sure your Authorize.Net account details are valid. If the account validation fails, check to make sure you entered the account details properly. Select the default country you want to display to the customers for online payments. Select the currency you want to use in your transactions (US or Canadian dollars) – this should match your Authorize.Net account. Note: Do not change the currency after your site begins accepting online payments. If you change the currency, existing payment records will not be recalculated and will no longer display correct amounts. Add payment instructions to be displayed to the customer. Now that you have set up your Wild Apricot site to receive online payments, a Pay online button will appear after a visitor to your site clicks the Confirm button while applying for membership or registering for an event. 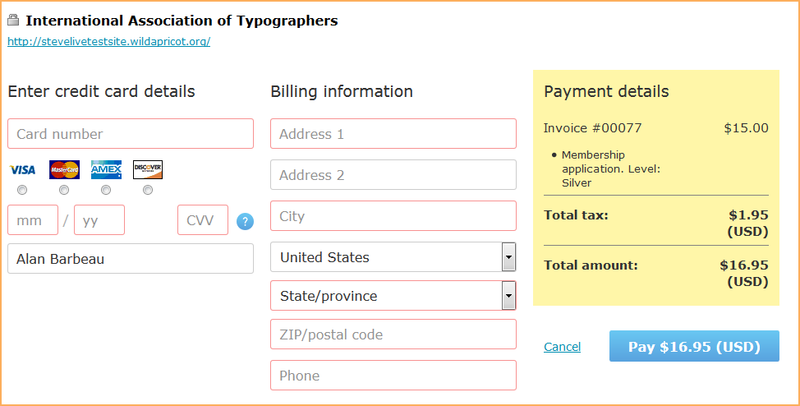 Make sure your Authorize.Net settings match your payment settings in Wild Apricot. In your Authorize.net settings, make sure your account is set up as a Card Not Present account and not a Card Present account. Make sure that no form fields in your Authorize.Net account are defined as required. The Wild Apricot payment form only asks for name and address, so if in your Authorize.Net account there are additional required fields then an invalid configuration error will occur. Check your Wild Apricot audit log for transaction errors and compare them to Authorize.Net error codes.